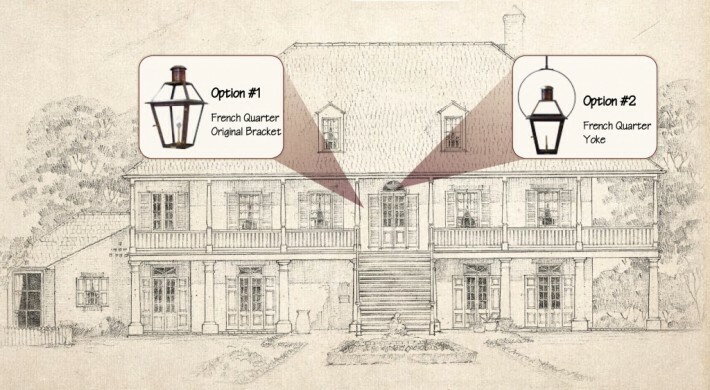 There are so many aspects that go into choosing the perfect lights for your home: What style goes with the architecture? How many lights should there be? Where do they go? Gas or electric? What is the proper scale? Don't get overwhelmed; let us help. Bevolo has a team of Lighting Designers with generations of experience. Every aspect of the home will be taken into account when we look at your project. We will narrow down your options from the hundreds of combinations in our line to help you make the best decision for your home. Send us a copy of your elevation or photos using the form below (if you'd rather, mail it). We will look at your project in its entirety and come up with a comprehensive plan for every light in the home. You will then receive photos, schematics, installation instructions, and even utility locations if you need them.